Yellow Enallopsammia stony coral with pink Candidella teeming with brittle stars. Photo by NOAA. 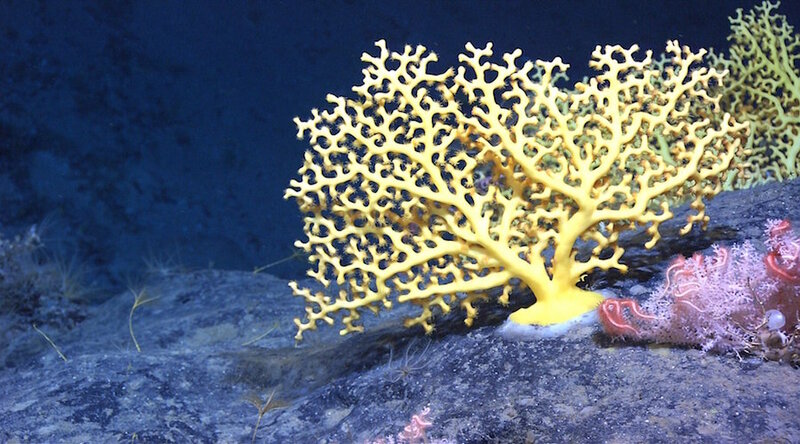 Researchers from the University of California San Diego and the Massachusetts Institute of Technology are advocating for collaborations between academia and industry when it comes to finding a balance between exploiting mineral resources from the seabed and protecting vulnerable marine ecosystems. Matthew Alford, a physical oceanographer with the Scripps Institution of Oceanography at the UC -San Diego, and Thomas Peacock, director of the Environmental Dynamics Laboratory at the MIT, are making the call following a field study investigating potential impacts of extracting minerals such as cobalt, copper, and nickel from the deep-sea. According to a university press release, the two conducted a simulation of sediment plumes that would be created by seabed mining. From onboard research vessel Sally Ride and using samples obtained from a proposed mining area in the deep Pacific Ocean, they ejected plumes of particle-laden water like those that would be produced during such operations. Their goal was to understand how the plume disperses in the water column between the surface and the seafloor. From these data, researchers can assess how such plumes can affect marine life and over what distance. Researchers Matthew Alford (left) and Thomas Peacock. Photo by UC. Alford and Peacock see the access to this information as the key link that should connect researchers and industry. “A key consideration regarding seabed mining is the role of sediment plumes. 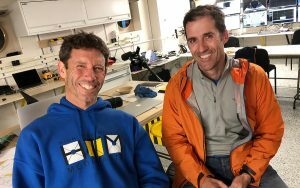 Using a combination of the latest ocean measurement techniques and modeling, and collaborating with ocean biologists, we can help determine their impact as regulations are being developed,” Alford said. The researcher and his teammate emphasized that in addition to the involvement of academic researchers, the International Seabed Authority should be part of all seabed mining projects to make sure that operations take place on a limited scale. The ISA, the U.S. Geological Survey, and a private company, Global Sea Mineral Resources, all participated in the Sally Ride cruise in what the researchers consider a model of collaboration going forward.